Police Chief Constable Bob Rich announces that an officer died in hospital after being shot near Mt. Lehman Road and Fraser Highway in Abbotsford, B.C., on Nov. 6, 2017. ABBOTSFORD, B.C. — A British Columbia police officer is being remembered as a "hero'' after he died Monday in an exchange of gunfire with a man accused of shooting at people in a parking lot. 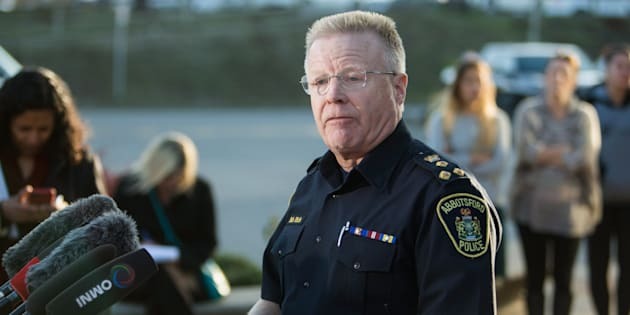 Chief Bob Rich of the Abbotsford Police Department said officers were called about a possible stolen vehicle in the parking lot of a shopping complex at about 11:30 a.m. The caller blocked the suspect's vehicle in while waiting for police to arrive, Rich said. "Unfortunately, a male suspect emerged from that vehicle and began shooting at the caller and others with a shotgun,'' Rich said at a news conference. There were several 911 calls reporting the shooting and police officers arrived in the area and attempted to engage with and arrest the suspect. Police officers investigate the scene of a shooting that left one police officer dead in Abbotsford, B.C., on Nov. 6, 2017. The suspect, a man in his 60s from Alberta, fled in the vehicle and police officers pursued him to the intersection of Mt. Lehman Road and Fraser Highway, Rich said. The man was apprehended and taken to hospital for treatment of non-life-threatening injuries. The deceased officer's name has not been released. Rich said the investigation will continue and there are still many questions left to be answered. He said the police department's priority will be supporting the officer's family and each other. "Our officers' actions today, all of them, were absolutely heroic,'' he said. "There were officers heroically trying to save the life of our member. There were officers immediately taking control of the scene. "When they responded to this, they responded in a way that was designed to protect the public. This person was trying to kill people, members of the public, and our officers responded. Police officers bow their heads while Chief Bob Rich announces that an officer died in hospital after being shot near Mt. Lehman Road and Fraser Highway in Abbotsford, B.C., on Nov. 6, 2017. An employee at a nearby vehicle dealership said the fatal shooting is connected to a sports car that was allegedly stolen over the weekend. George MacDonald, a manager at MSA Ford in Abbotsford, said a man came in to test drive a Mustang around 9 a.m. on Saturday and drove off without leaving his driver's licence. Shortly before noon on Monday, a dealership employee noticed the vehicle parked about 400 metres away at a restaurant, MacDonald said. McDonald said he left to return a key to the dealership minutes before the shooting took place. "I did 20 years in the military but I'm not used to anything like that happening this close to home,'' he said. Police officers investigate the scene of a shooting that left one officer dead in Abbotsford, B.C., on Nov. 6, 2017. The Independent Investigations Office, which looks at all officer-related incidents that result in serious harm or death, sent its investigators to the scene. The office says it's believed the suspect was shot. Premier John Horgan issued a statement on Twitter expressing his condolences to the family of the police officer. "Deeply saddened to hear of the death of an Abbotsford police officer today. My heartfelt condolences go to the family, friends and colleagues,'' he said.